Does Your Lawn Have Chinch Bugs? Usually when we get a call from a new potential client about brown spots in their lawn, they mention they were told by someone (their landscaper, family member, friend) that it is probably chinch bugs. As a pest control company, we would be the perfect solution for resolving this problem if it was in fact chinch bugs damaging the lawn. However, based our experience treating and fertilizing many lawns in South Florida, chinch bugs are the cause less than 25% of the time. Sometimes, people also mention they believe it may be fungus that is turning their lawn brown in certain sections. While this is certainly another possible cause, we believe there are cultural issues that more frequently are the real cause of brown spots and damage in your turf. By following best management practices for maintaining your lawn, you will maximize the health of your turf and give it a great chance at fighting off damage resulting from environmental stresses. In the South Florida area, the most important prerequisite to having a healthy lawn is to have a functioning sprinkler system. Many times, people believe because they have an irrigation system and it turns on, their sprinkler system is not the problem. 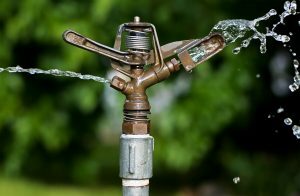 While many people have a landscape company and also a pest control company maintaining their landscape, they often have not had their irrigation system checked in over a year. Over time, as plants and roots grow over sprinkler heads and block the coverage, those sections of your lawn that are not being hit by the sprinklers will die if rainfall is not sufficient and temperatures are high. Other causes of poor or inadequate coverage include mowers or vehicle tires breaking sprinkler heads, dirt clogging sprinkler heads, and pressure imbalances in your irrigation system. 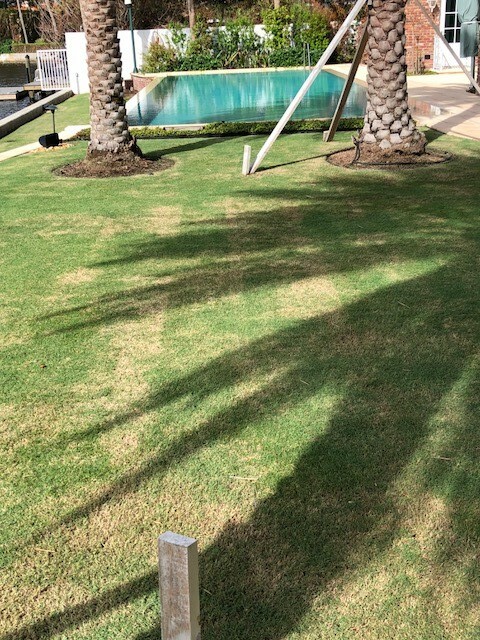 To eliminate this as the source of brown spots in your lawn, we highly recommend you call a highly rated local irrigation company to inspect and repair your system as needed. The vast majority of lawns in our service area (ranging from Jupiter to Palm Beach to Boca Raton,) are comprised of St. Augustine grass. To encourage deep root growth and turf density, we recommend St. Augustine grass be maintained at 3-4 inches height at all times. Any time that more than 1/3 of a leaf blade is removed during the mowing process, the turf will be stressed and over time will likely die in certain areas. Often, we see that lawns are damaged from being “scalped” by mowers. This often happens when your landscaper is not aware of best mowing practices. By cutting your lawn short, the roots of the turf will be shorter and less resistant to extreme temperatures and drought. When the lawn has short roots and is weak, it is much more susceptible to damage resulting from environmental stress and pests. Yes, even though it is not the most common cause we see, chinch bugs can certainly be the cause of your lawn dying! With proper mowing and irrigation, your lawn will be much better prepared to withstand the damage that can be caused by chinch bugs. 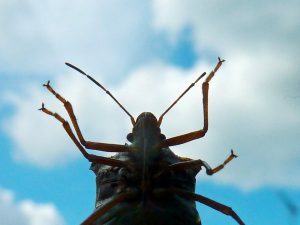 Chinch bugs are most commonly found in the summer months when temperatures are the hottest. 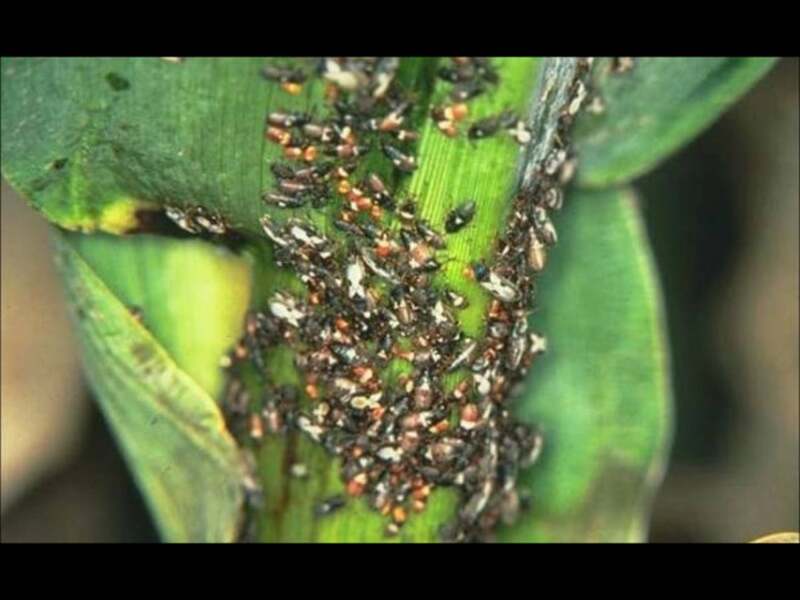 The best way to see them is to get down on your hands and knees and look very closely at different sections of your lawn for any movement at the base of the leaf blades. By having a licensed pest control company perform regular fertilization and insect control, you can eliminate chinch bugs as a threat to your lawn. 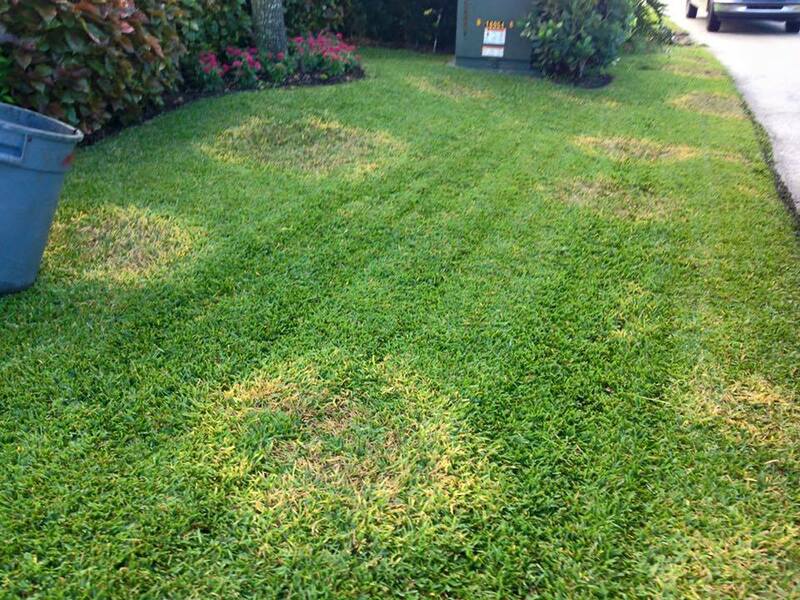 The most common type of fungus we see in the West Palm Beach area is Gray Leaf Spot Fungus. The vast majority of lawns we see in the area already have Gray Leaf Spot fungus, which is prevalent in St. Augustine turf in South Florida year-round. This fungus is typically a result of over-watering your lawn and is a visible symptom that your lawn is stressed. The second most common fungus we see in our area is Large Patch/Brown Patch fungus. Large Patch fungus is also a result of excessive watering, but typically only shows up in our area from November through March, when night temperatures are low. By following best management practices and having your lawn treated on a regular basis, fungus can be prevented. Tackle the problem quickly and efficiently by choosing the professionals. From ants to mosquitoes, roaches to mice, we’ve got it covered. Ensure your lawn remains healthy with lawn care services from our team. We check the health of your plants to prevent future disease and infestation. Monthly or quarterly, we’ll safeguard your property. With eco-friendly preventative products and a detailed eye, we protect your home from future issues. We can eliminate your pest problem at a fair price. Reach out to us today for a free estimate on both one time services and our treatment plans. ©2019 Native Pest Management | All rights reserved.